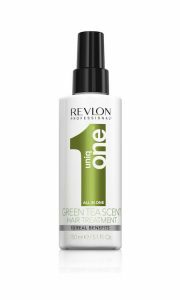 We’re feeling fresh and fruity (Ooh er) here at Respect towers at the thought of UniqOne Green Tea, the newest recruit to the Revlon Professional UniqOne line. The citrus scent is just heavenly! This iconic leave-in spray is jam-packed with multi-beneficial ingredients and has become a favourite with us busy ladies needing an all-in-one product that delivers but demands minimal time. 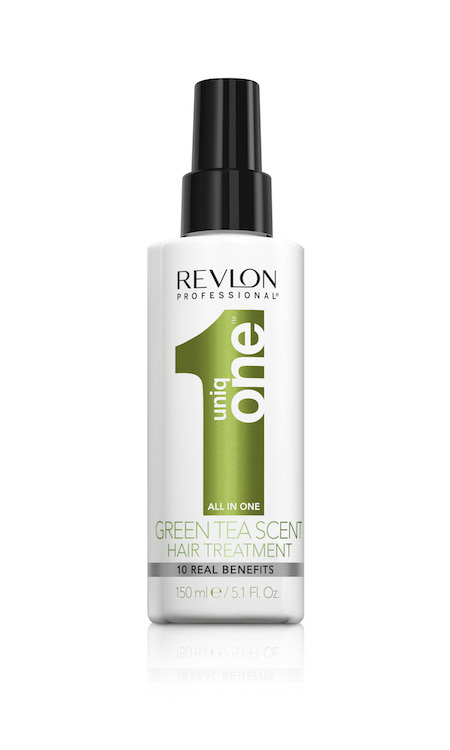 The nourishing formula of UniqOne Green Tea offers ten benefits to all hair types. Firstly, it works to repair dry and damaged hair, controls frizz, adds shine and leaves the hair smooth, silky and easy to style. Thanks to the UVA and UVB filters, it also works to protect hair colour. Finally, when it comes to the finishing touches, this ingenious spray helps to add body and fullness. Spray the product onto wet hair as a leave-in mask before drying or styling. Alternatively, use the product on dry hair to revive style and shine throughout the day.